I think the stock front cladding has a good capability for using a smaller FMIC. Since it has to be fabbed from scratch anyways, it is possible to get it closer to the chassis than the Mooncraft did. 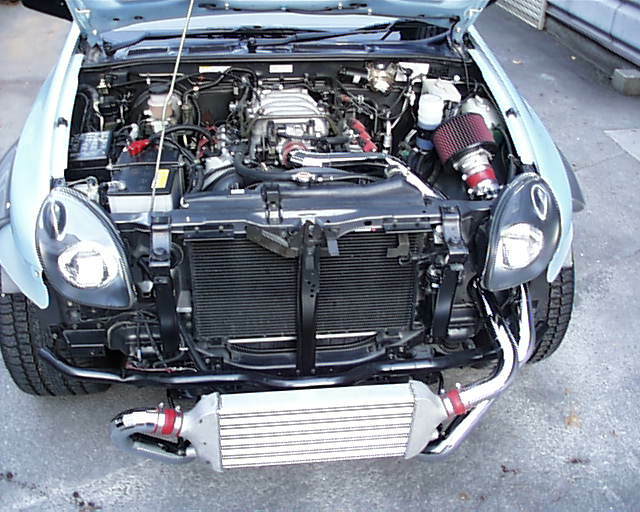 Looks like quite some space in there.... probably to keep it away from any radiator heat, but shouldnt be an issue if JDM's isnt putting out enough compression and only a small dose of cooling takes place with the FMIC anyways. Hell, even something small like the top mounts on the STi might suffice in that location without butchering the front end, heh. So the wheel well was the best you could manage for plumbing? Hmm, shame. But hell, good to see you got this far along so far. Thanks for the pics, but YIKE! One, I'd like to be able to turn left again and two, have you calculated the pressure drop on that Rube Goldberg plumbing layout? Did you even consider simply fabbing new manifolds before neutering the roadability of the vehicle? The last thing you want on an offroaded vehicle is a turbo that isn't there, isn't there, then WHAM!!! It's there! Now my tires are spinnin', 'stead of grabbing. This setup is gonna have some lag in it. Climbing rocks begs a S/C methinks. Generally I agree that turbos aren't very well suited for off-road gasoline applications, but what we've been kicking around for my rally VX is to use two T-14 or T-23 turbos sitting on top of either tubular or log-type manifolds. Simple, robust short tube runs with everything accessible and high to eliminate heat or dousing issues. More than likely I'll end up with a 4JG2 diesel in it, but that's down the road until the big shop is done. 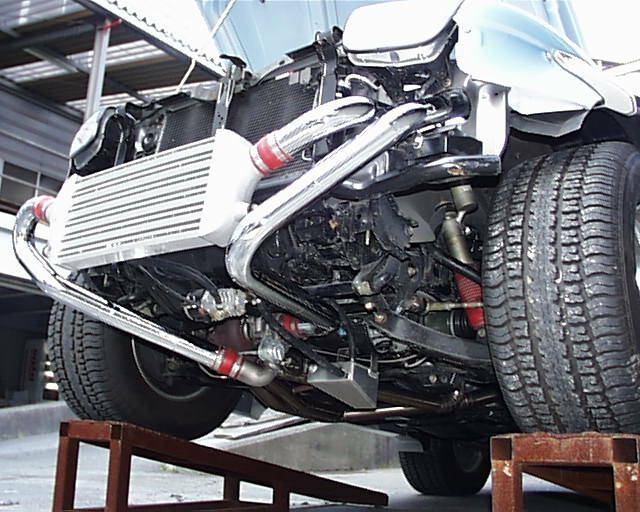 With what is proposed here you'll either set something on fire from radiant heating or the cast-iron section of the turbo will crack from constantly being drenched or packed in mud, especially if you try to implement heat shields in an area that's a "catch-all" underneath the chassis. What's your plan for addressing vibration on what looks about 20' of tube? When it's all said and done you'll need the extra horsepower to offset the added weight. Right'o. Turbo for tarmac. S/C for insta-grab (that be dirt to ya'll city folk.... like me ). Still, as a city to rural/suburban city transplant now, T/C and S/C appeal. Thus, the Rex and the Vex, heh. I still think you are gonna wanna take a look into the pressure cause that setup really does concern me when it comes to lag. And without a proper tune (REALLY good luck on that one), I fear you wont see a bit of gain. But please, prove me wrong and make it work. I love an ongoing project. Part of the issue with doing a proper turbo setup(turbo just after header) is getting it emission certified. The setup he's trying to build is more like a cat back exhaust. I'm curious what the ECU will think when the BOV opens and metered air reverses through the MAS. I'm thinking that it will read as additional air intake, and dump in fuel for it as you lift the throttle. With the BOV spring set stiff enough to remain closed at idle you may get some surges. I do give props for trying though. Ya, a good performance tune should be able to keep it from running ultra rich, but.... that's the question right there isnt it? Tune a VX? I remember years ago we had a member who programmed access ports for GM or something and he was gonna try to get around to putting together an access port for us to harness up to the ECU. I never did hear the end of that. I took my VX to my WRX guys here in town to see what they thought about a post S/C tune and after 10 mins, they just threw their arms up and said "sorry dude". Damn shame cause I thought that if anyone could find a way, it would be them since they are one of the most renowned mid atlantic import tuner shops. Wow, this is fascinating. More power would be great on these vehicles. Although the large FMIC looks good, I might prefer a smaller side mount (in the front of the wheel well.) Or maybe cool the pressurized charge with an Aquamist water/methanol injection pump? Like someone said elsewhere in this thread; water or mud hitting a red-hot turbo housing is never a good thing. Even a titanium housing couldn't take much of the thermal shock of that. I'm thinking that this project will get expensive (much more than $2,500) because of other upgrades... like a bigger brass radiator, electronic boost control (with AI fuzzy logic), new MAS, bigger fuel pump, injectors, air/fuel control, and associated stuff.